The software converts emails from exported PFC file into EML file format. This conversion allows users to export AOL PFC to Thunderbird, Outlook Express, WLM, Apple Mail, and all other email clients that support EML file format. With a high-tech Live previewing technology of PFC to EML File Converter, one can preview all the email contents including attachments. Users can view mail body, attachments, and header properties for verifying the conversion accuracy. The enhanced filtering feature provided by this tool facilitates most common requirement of performing selective AOL PFC to EML migration. One just needs to select desired files/folders whose emails can be saved in .eml file format. PFC to EML Converter assures users that the tool will not affect the original email formatting after the conversion process. The application will process high advance programming that maintains the data integrity throughout the process. The tool supports exported PFC files of almost all editions of AOL email client, including its latest ones. Talking about the compatibility with Windows operating system then, it supports Windows 10 & all the previous versions. After the conversion, customers will be able to save emails items in 5+ naming convention options. AOL PFC to EML converter provides users to choose any of the provided naming options to save all the emails in EML file in a customized manner. It becomes a challenging task for a person to save AOL PFC emails in .eml file format. There does not exist any straight forward approach for the same and hence, leading to increasing demand for a solution to export AOL PFC to Thunderbird. Whenever users try to perform the same task, they may face one or the other error. Apart from this, trying for a manual approach might lead to negative impact upon other existing programs of the machine. All these points describe the need of a third-party application, which is error-free and independent of any supportive application. The software is an error-free approach to export PFC file emails to EML file format. Users need not worry as there is no need of installation of any email client for software working. The AOL PFC to EML conversion is held in a step-by-step manner without providing any harm to the existing data. 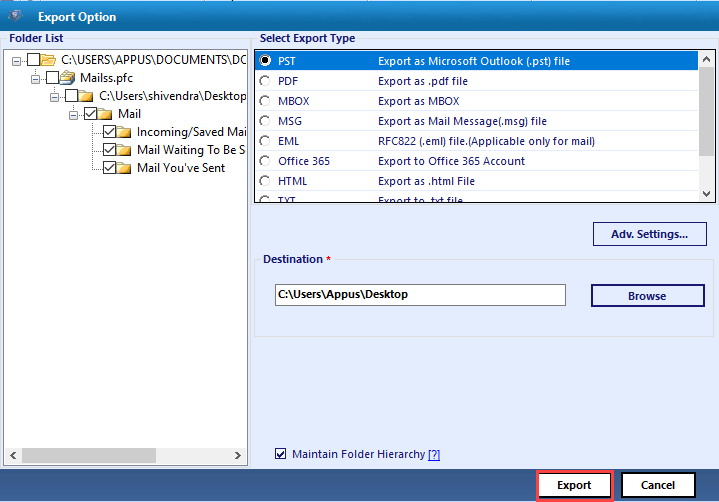 The solution enables users to export AOL PFC to Thunderbird, which is an email program supporting EML files. 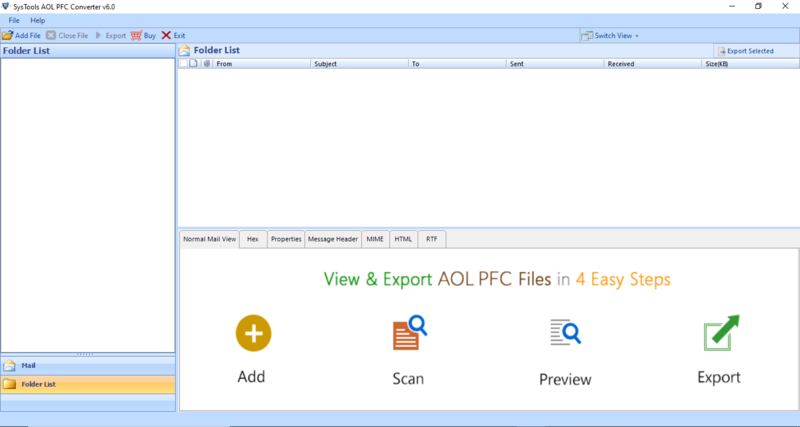 The Demo version allows you to view AOL PFC emails & export first 25 items/folder to EML file format. 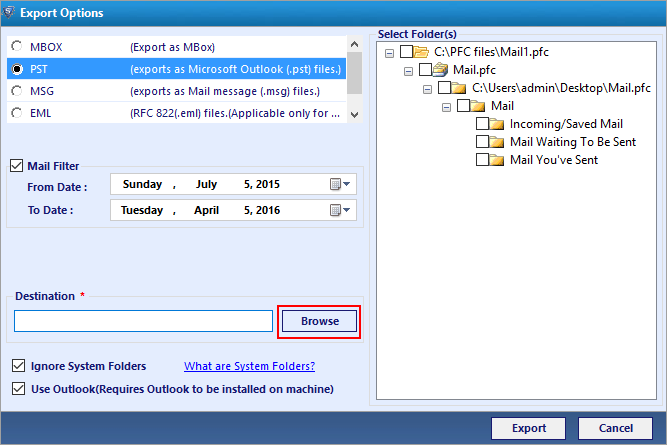 MS Outlook Installation is optional to convert AOL PFC file to PST. AOL: AOL versions 10.0, 9.0, 8.0, 7.0, 6.0, etc. Explain the working of the application? Step 1: Run AOL PFC to EML Converter tool. Step 2: Add PFC file. Now, the tool will show the items in the file. Step 3: Click on the Export button and select EML file format. Step 4: Apply EML settings and filters for selective email conversion. 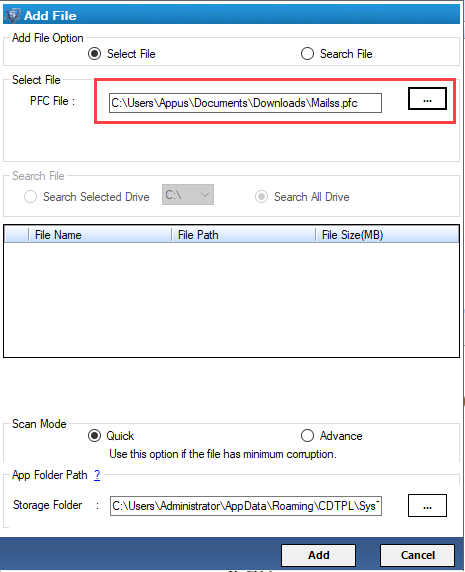 Step 5: Now, browse the location to save all the converted EML files. Step 6: To proceed, tap on Export button. Now after conversion, you can view all the MSG files in the destination location. I have just being provided with a task to export all emails of PFC file to EML format. However, I am neither having AOL email application in my system nor any other email program. Will I still be able to perform conversion with help of your utility? Yes for sure, you will be able to perform the migration with our AOL PFC to EML converter. It does not require any supportive application for its working. Therefore, you can work with this utility without any dependency concern. Can I operate this software on MAC operating system? No, our software is a Windows-based application that is supported only on Windows OS. The migrator is compatible with Windows 10, 8.1, 8, 7, and all the below ones. Is it possible to export multiple PFC files to EML all at once? Yes, our software supports bulk conversion of PFC file to EML. You just need to add multiple PFC files one-by-one and then, continue with further exporting operation without any worry. What is the maximum size limit up to which I can export PFC files to EML with help of your utility? There is no file size limitation in our software. The AOL PFC to EML converter supports conversion of an unlimited sized file in a hassle-free manner. "Currently, I got stuck while creating a backup of AOL PFC emails on the local machine. I needed to save all emails into single .eml extension. This PFC file to EML Converter allowed me to export AOL emails to Thunderbird with an ease. I am very much grateful to the firm who developed this effectual tool." "It is the best software for performing migration from PFC files to EML format. Till today’s date, I have operated multiple applications for the same task but, none of them fulfilled my need. PFC file to EML converter of FreeViewer was the one whose UI, speed, and accuracy, all are really amazing." "It was a difficult task to convert single AOL PFC email to EML file extension manually. It was a time-consuming and lengthy process. But with the help of this utility, it was really simple to export multiple emails from AOL Desktop to EML. This solution made this possible within few minutes. Thanks for such tool!" "AOL PFC to EML Converter is an effective utility that helps you to convert selective or bulk emails from AOL Desktop email client to Outlook Express EML file format. The interface of the application is quite simple that one with no technical knowledge can also perform the conversion. It takes very less time to export the emails. I must say that tool is really amazing!"